Legendary Rapidograph stainless steel tubular tips. Engraver's Precision. Perfect for Embellishing, Outlining, Illustrating, Loose Sketching and Pointillist Technique. 7 Pens with Nib Keys & Ink. Special Smaller Tip Sizes for Fine Art Use: 6x0, 4x0,3x0,00,0,1,2. 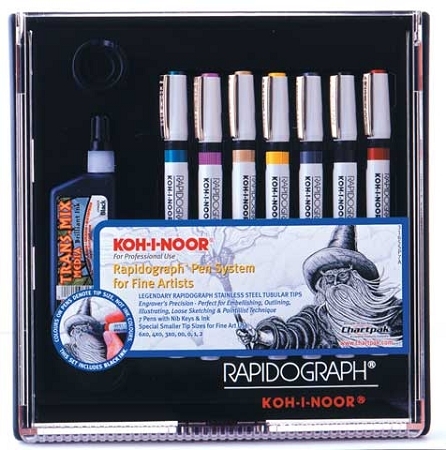 Set of 7 Rapidograph Pens, Contains 3085-F Ultradraw ink. For drawing on paper. No Clogging! Waterproof! Ultradraw provides good open time, but dries quickly on paper. No ammonia or other unpleasant odor. Dense blackness, easy flowing. Non-smearing. Good erase-ability but otherwise permanent.